Workshop is set back from the road, beside number 32 Angle Street. For all your framing requirements in Stonehouse, Lanarkshire and the West of Scotland. Dial-a-frame - I'll come to you. Pick a place and time to suit or organise a time to come to the workshop. Contact Peter @ The Picture Framer (ML) for a bespoke framing service. Handmade picture frames made to your exact specifications. Turn your artwork, photograph or even object into a focal point of any room. Peter the Picture Framer provides an excellent bespoke picture framing service at an affordable price. I asked Peter to frame a few items for me that I brought back from holiday. He took some time to show me the different options. I am so pleased with how they turned out and I would recommend him to anyone. 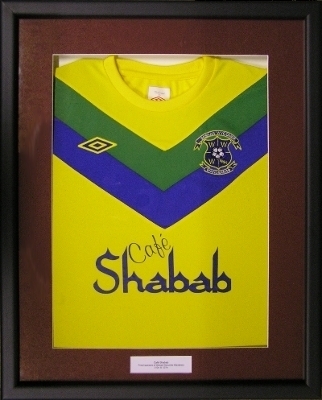 Have your treasured sports top framed by Peter. It will keep it safe for many years and become a talking point for everyone who sees it. Photo back up. Looking great. Thankyou.